If the num­ber of people vis­it­ing your web­site is im­port­ant to you or if you meas­ure the suc­cess of your site by it’s vis­its, there is an easy way to in­crease Traffic: Search en­gine op­tim­is­a­tion and Google ads. But that’S the fast track to ruin. There is this thing called Search En­gine Mar­ket­ing, mainly Google Ad­Words and dis­play ads. In com­bin­a­tion with on site search en­gine op­tim­isa­tion it is a power­ful tool to in­crease the aware­ness of your web­site. And thus its traffic. But it comes at a cost. Vir­tu­ally if you pay for Google Ad­Words or as hid­den costs of pay­ing a pro­fes­sional to ana­lyse and code your site to be search en­gine op­tim­ised. Okay, let’s as­sume you are fine with spend­ing your money on ads and key word ana­lysis. But what do you do with the vis­itor you just at­trac­ted? Are you wel­com­ing them with a land­ing page that barely meets the key words of the ad—or do you even send them to your home page (wich is worse)? Are you con­fus­ing them with a wild bunch of products and a nav­ig­a­tion no one un­der­stands at first glance? Are you put­ting them off with too many re­quired fields in your con­tact form or with for­cing them to sign in when they just want to buy? Are you leav­ing them alone with ques­tions they may have and don’t en­cour­age them to turn to you via phone, e-mail, chat, twit­ter, face­book and so on? If you answered all these ques­tions with “no” you can stop read­ing here. You seem to be well pre­pared to wel­come new vis­it­ors with a thor­oughly op­tim­ised web­site and it is a bril­liant idea to in­crease traffic with money. But if you don’t put the user ex­per­i­ence first, if you try to in­crease traffic now and care for UX later, I think you have a prob­lem. So be­fore you ask for SEO you may be well ad­vised to care for UXO—user ex­per­i­ence op­tim­is­a­tion. Yes, sure I invented UXO. But think about it: The web is about users not numbers. And conversion is about users as well. And even Google tries to deliver good content to people. It may seem like Google is this divine eye on overwatch of the digital world. But they make a living on delivering results for real people. 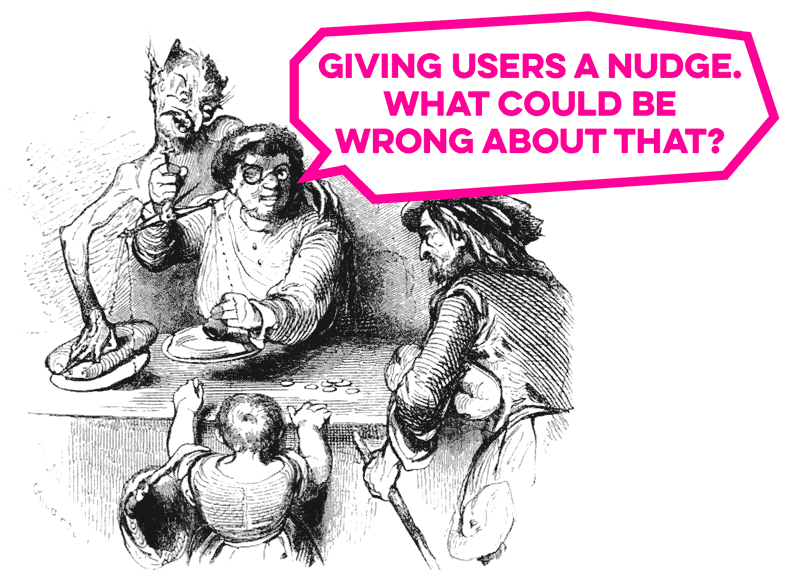 They know that user acceptance is their most valuable benefit. And just so, you sell your products to real people, not to search engines. It’s not all about being found but being nice. Google doesn’t buy your stuff, people do. Yes, there is a truth to more visits = more sales. But quantity is not the problem in the web. And yes, if you have a very niche product and a very small target group you may be forced to put a lot of money into advertising and marketing. But only if you aim for a local audience not a global. Only if you have only a limited number of customers in your area, you need to make yourself known—and that will cost you money. But in the web, you have an unlimited number of potential customers. You have a niche product with little competition. You try to sell your product within a highly competitive market. In both cases people will find you and your product. Either because you are the only one selling that stuff, or because so many people are searching. And once they found you, all you have to do is convince them that you are the perfect fit. You could do this by offering the lowest price, but who wants that? What you’d rather do, is give them an assuring brand. You don’t get a USP by buing a massive number of visitors but by building an extraordinary user experience. To be frank, there is a third scenario, that AdWords are very suitable for: You have a new product with little competition, that nobody knows about. If you can’t expect anyone to search for a keyword you address, you probably give them a nudge towards the thing you sell. But then again, should you not rather put your emphasis on content marketing and reaching influencers and early adopters? Invest in your brand, not in Google. So let my try to conclude. I think that buying visits is a short sighted approach. Thinking about your users first, is cheaper and more efficient. You spend less money on a longer lasting revenue. And you invest in your brand, not in Google. And there is a side effect to UXO you should not underestimate. UXO makes good SEO but not the other way around. You can make a web­site per­fectly Google op­tim­ised but the users hate it. If you write good copy, for people to easily grasp, if you have a low barrier site structure, search engines will love your site—and not only those you did bribe.